Here it is! The big daddy of ad scans! Walmart!!!! With an opening at 6 p.m. (mirroring Target), they are staggering their sales as well with 6 p.m., 8 p.m., and 6 a.m. sales (don't worry-- we are going to prepare you with a plan for that!). What we are loving: Skylanders Trap Team for $37. 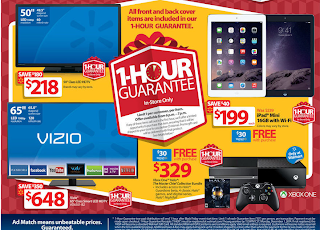 Pay special attention to this one, as Walmart had this price BEFORE Black Friday last year! Train Table for $40! And the Little Tykes Kitchen for $40. Lots of Good deals. Click HERE for the full ad! This post contains affiliate links. MamaBreak may earn a commission on click thrus form this site. This will not impact your viewing experience. We only recommend product and services we think our readers will love. As always, we thank you for supporting MamaBreak.